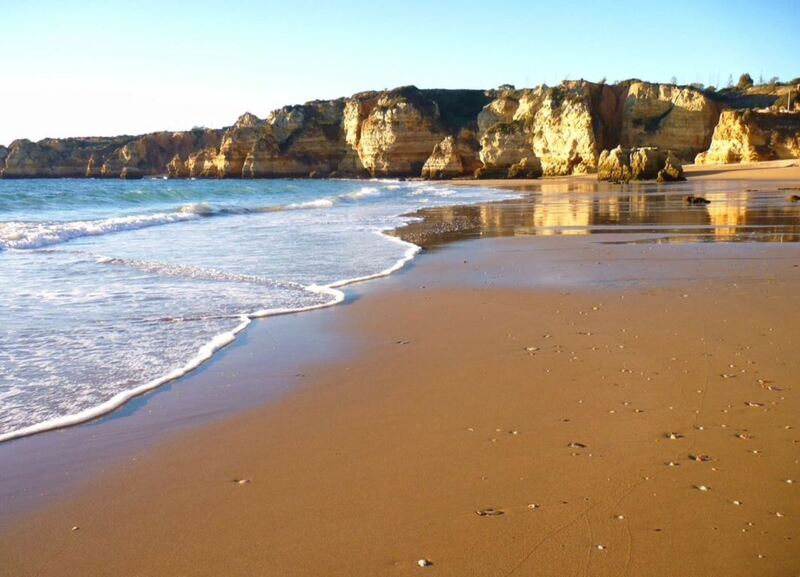 Praia da Dona Ana is a beautiful beach near Lagos in the Algarve. It is famous for its clear water and spectacular cliffs. 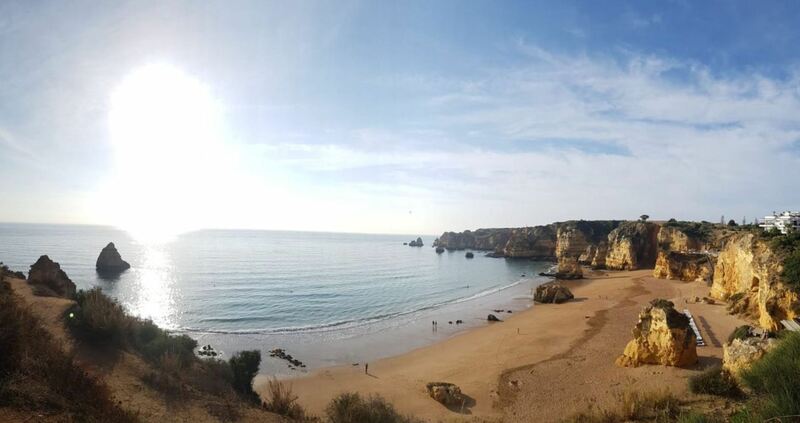 Praia da Dona Ana is one of the most photographed beaches in the Algarve. 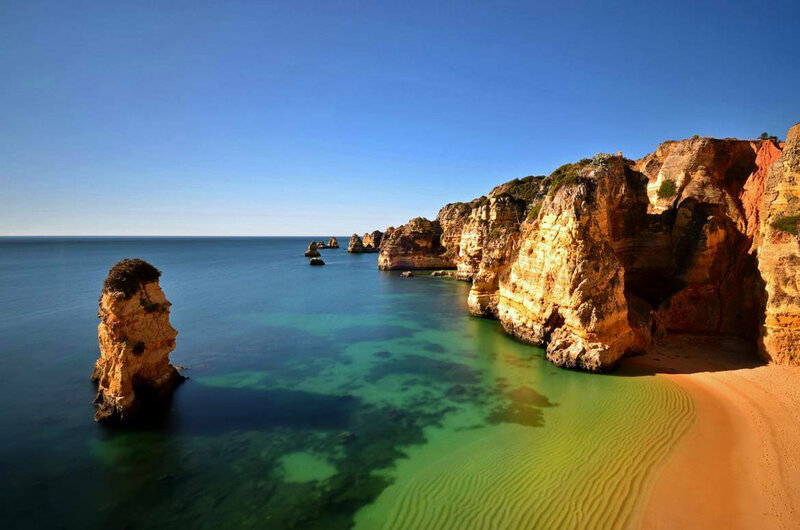 You can find pictures of the beaches on many postcards and billboards that promote the Algarve. Are you going to Lagos anytime soon? See the short video below to see why you should visit this beach. 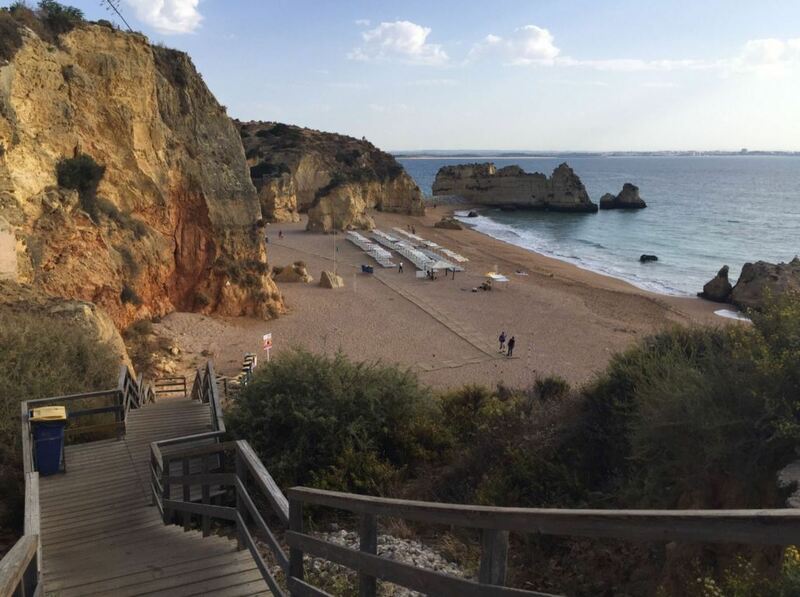 Praia da Dona Ana is about 160 meters long, making the beach not that big. 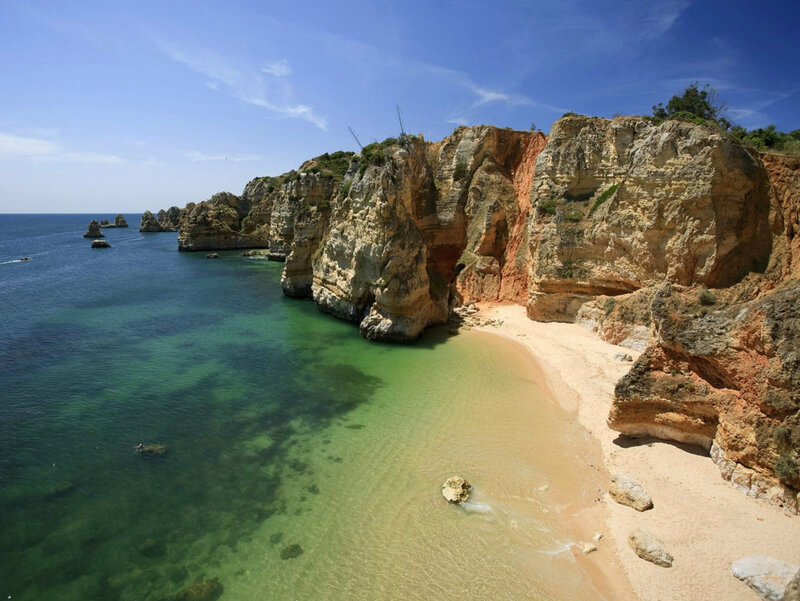 The beach is located between the town of Lagos and Ponta da Piedade. The beach is flanked by Praia do Camilo and Praia do Pinhão. The cliffs surrounding the beach provide some shadow, which can be nice on a hot day. In summer, shadow will cover a big part of the beach from around 17.30. 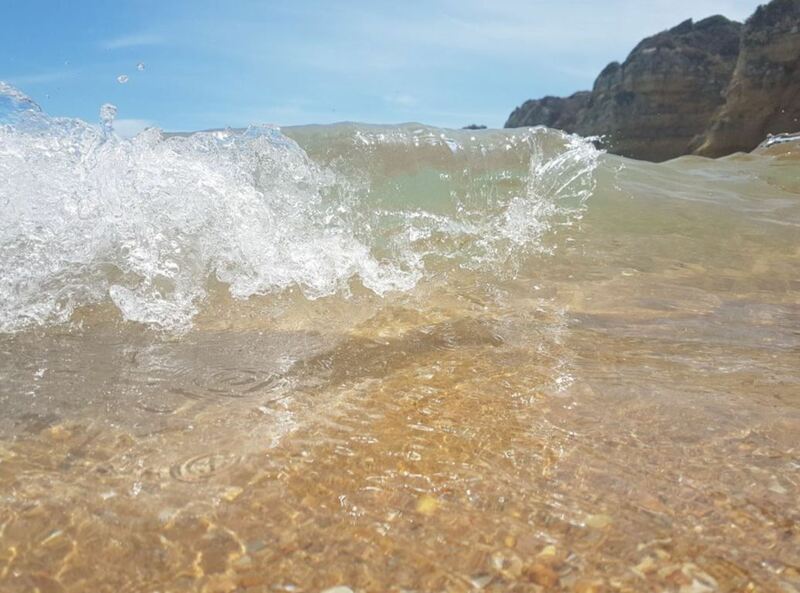 The sea water at Praia da Dona Ana is very clean. The rock formations of Ponte da Piedade protect Dona Ana beach against waves from the southwest. This is why the sea here is quite calm. This is also why the beach is very popular for snorkeling. You can see a big variety of flora and fauna underwater. There are almost no currents or big waves. Be warned that even in mid-summer, the water can be very cold. Once you get in the water, it takes some time to get used to the temperature. You will find many shells on this beach. If you like collecting shells, this is the place to be! 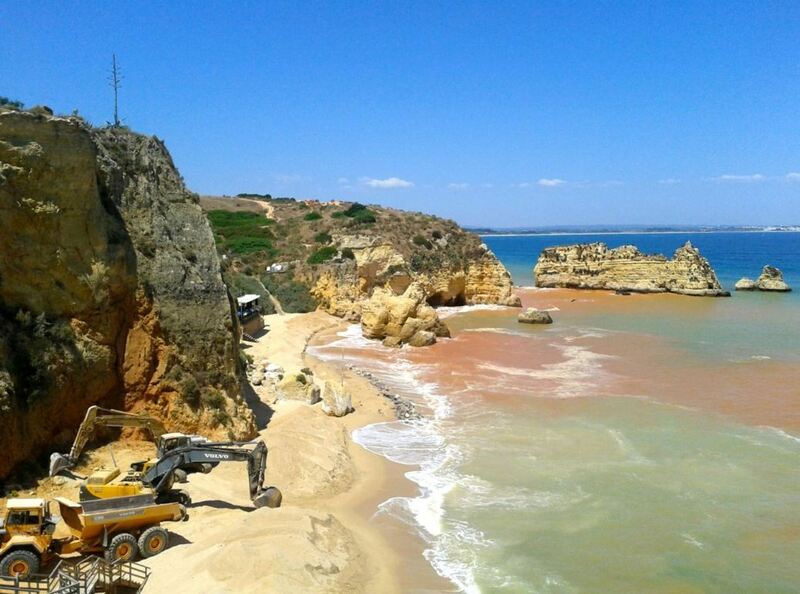 The sand at Praia da Dona Ana is not very soft, since the beach reconstruction in 2015. The beach is very near the town of Lagos. Thus it can get very crowded on the beach, especially in the summer. If you want to take the best pictures, come early, to avoid the crowd. And if you feel like you want a beach with more space, go to the nearby Meia Praia. Access to the beach is via a long stairs. The stairs has 93 steps. This makes the beach not easily accessible for older people or for people in a wheelchair. The name Dona Ana came from a nun called Ana. She lived in a convent in Lagos. During World War I, soldiers invaded the convent and murdered all the nuns, with the exception of D. Ana. She had access to a tunnel between the convent and the beach, through which she fled and survived. Years later, the beach was named after her. 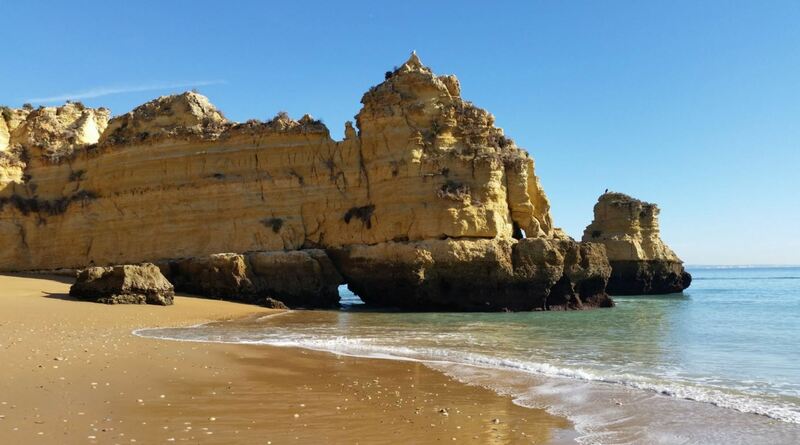 Praia da Dona Ana is surrounded by impressive rock formations. Standing on the cliffs, you have an amazing view over the sea and the beach. 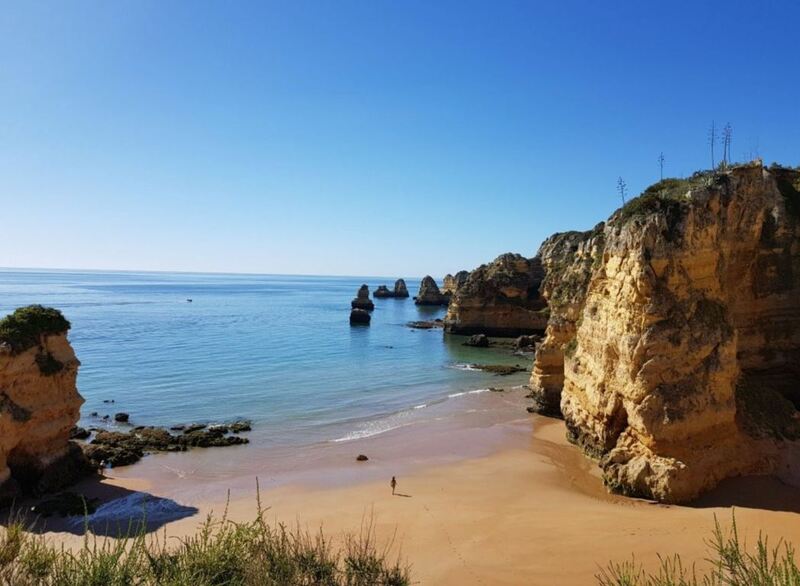 The cliffs views alone are enough of a reason to visit Praia da Dona Ana. From the cliffs up above you also have a great view of the sunset. All the pictures in this article show how Dona Ana beach looks like present day. 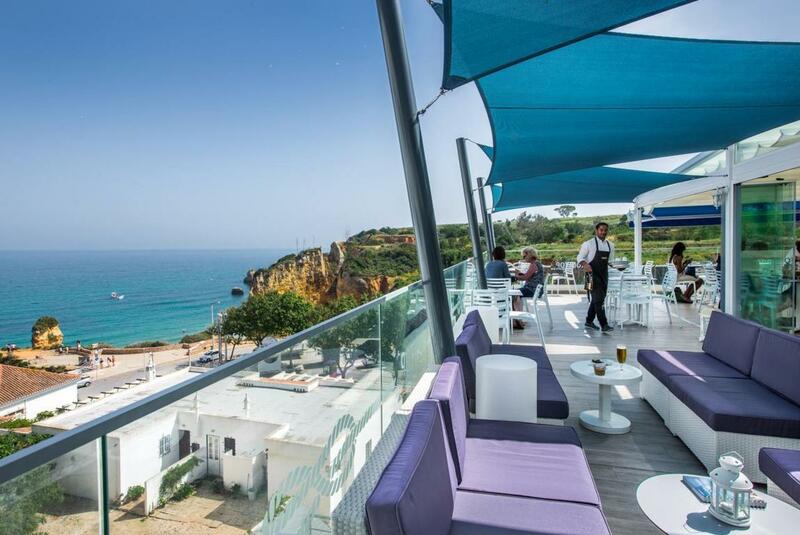 But did you know that Praia da Dona Ana looked different before 2015? In 2015, the municipality of Lagos decided to reconstruct the beach. They increased the beach in terms of size, by doubling the area of sand. The reason for this was to protect tourists from the crumbling cliffs. 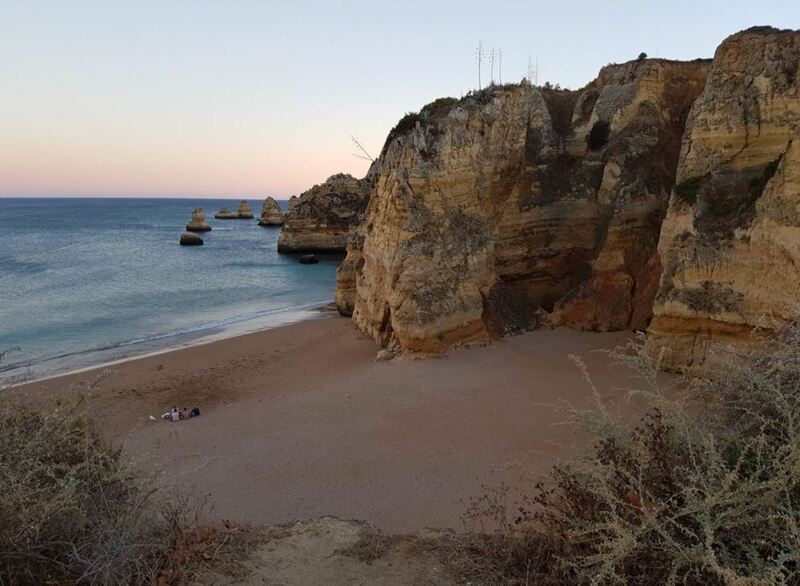 As the reconstruction only happened a couple of years ago, you will find many pictures online of the old Praia da Dona Ana, where the beach had less sand. The reconstruction costed around € 1,8 million and the project was supervised by Portugal’s Environmental Agency (APA). The project was very controversial among residents of Lagos. They pointed out that no environmental impact assessment had been done before the sand replenishment works began. The APA said the project was vital to keep people safe and away from the cliffs. 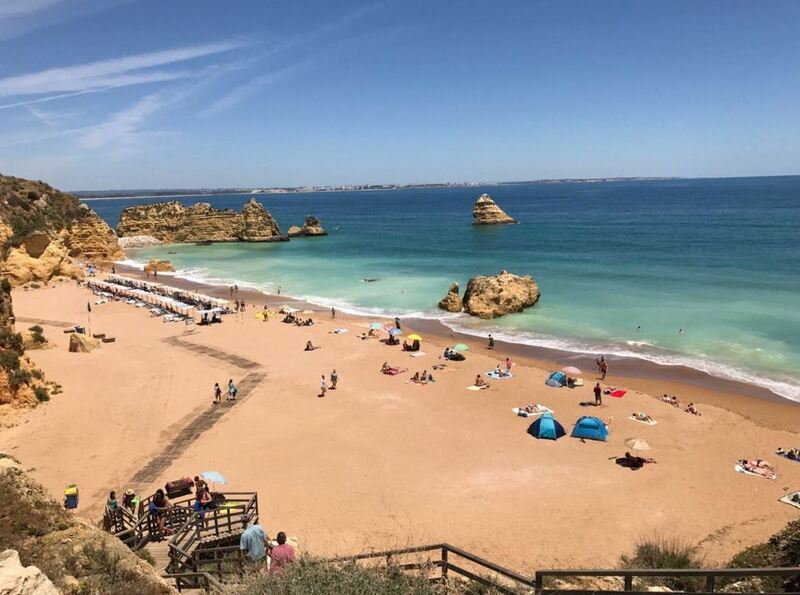 After the project was finished, the government of Portugal stated that the beach had not been adversely affected, and that the safety of visitors had improved. Locals disagree: they say the beach has lost the beauty that it once had. See the pictures below for the difference before, during and after the beach reconstruction. 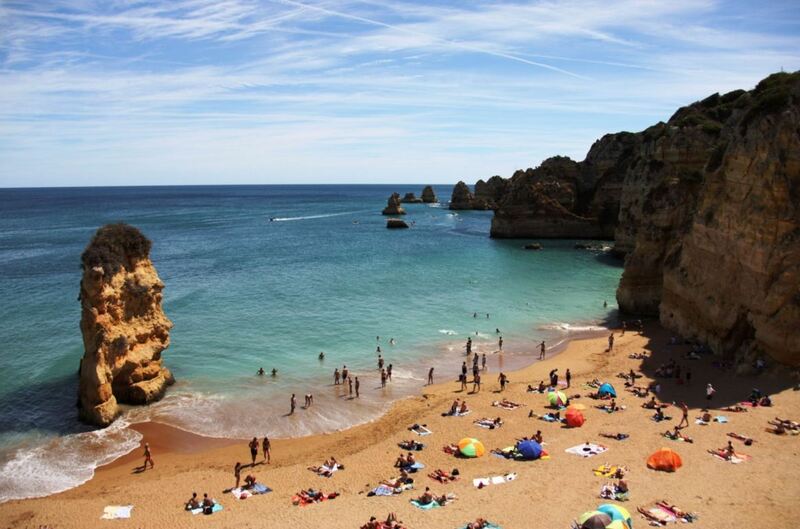 Praia da Dona Ana is reachable by foot from the center of Lagos (2,5 kilometres). Just follow Avenida dos Descobrimentos (the main harbour road) south, turn left at the fire station and then follow the road in the direction of the Iber Lagos hotel. The walk takes you to the top of the cliffs, from where you have an amazing view. Highly recommended. If you go by car, you can enter the following address in your GPS: Dona Ana, 8600-315 Lagos, Portugal. Parking is on top of the cliffs, but there are a limited number of parking spaces. Make sure to arrive as early as possible, to claim your parking spot. There is also the option to go by bus. The bus goes every hour and costs around 1,20 euros. The final option is to go by taxi, which will cost you around 5 euros. 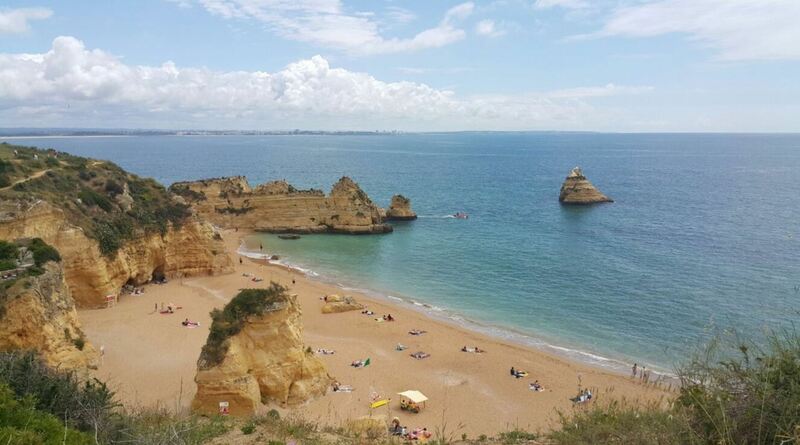 The coast around Praia da Dona Ana has many caves and grottoes that can be visited. We recommended to take a boat tour to explore these wonders of nature. You can book some boat tours already online. See our recommended tours below. Restaurante Paraiso. 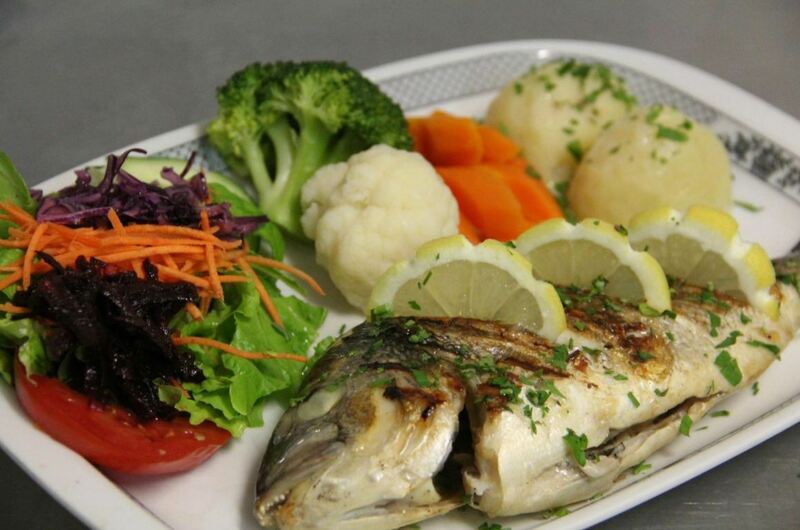 This restaurant has good quality food and great service. Prices are reasonable. Their specialty is seafood rice, which is delicious. Ashoka Indian Tandoori. This is one of the best Indian restaurants in Lagos. If you like spicy food, this is your place. Onda Norte. This family restaurant provides good value for money. They also have an excellent selection of wine. Make sure to try their steak or seabass. Carvi Beach Hotel. This hotel is located right above Dona Ana beach. The hotel has a nice rooftop swimming pool. Villa Doris Suites. This modern hotel is a 2 minute walk from the beach, and offers a hot tub and rooms overlooking the ocean. Big Chill Hostel. 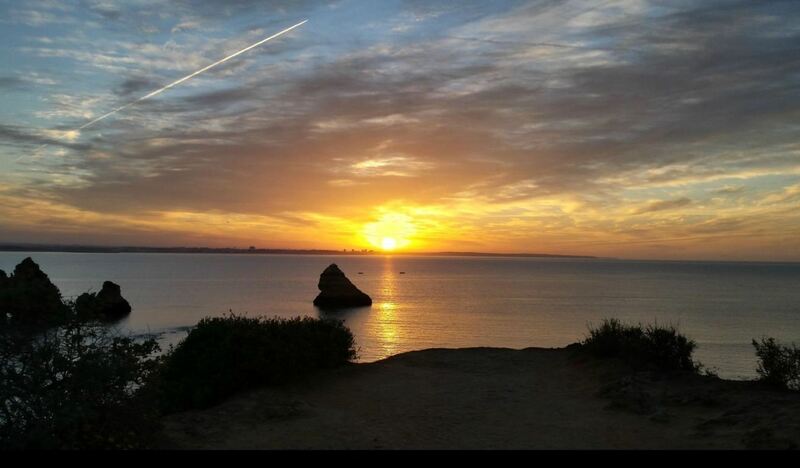 The hostel is 300 meters from Praia da Dona Ana and is one of the cheaper accommodations in the area. 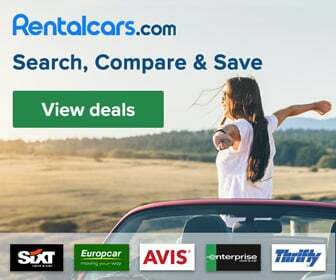 Good if you are travelling on a budget. To get to the beach, you have to descend a long stairs. This makes the beach not accessible by wheelchair. In 2018 there are plans to build a beach bar right on the beach, near the stairs. However, this project is very controversial, especially in the aftermath of the recent beach reconstruction works.